If you’ve heard of it, you may be wondering “What is Raspberry Pi?” Simply put, it’s a tiny, affordable computer that you can use to make a myriad of projects … including your own video game console. Building your own console may sound daunting, but trust me, it’s way easier than it sounds. In fact, it’s practically foolproof. You’ll find a list of things below you’ll need to get started on this new adventure, along with user-friendly step by step instructions to build your new glorious gaming rig. Best of all, when you add up the cost of the parts, it will still run you less than a modern gaming console. The hub of your new super console will be a Raspberry Pi. 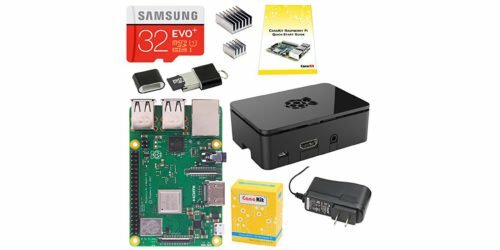 This kit is a basic starter and comes with the Raspberry Pi 3, power supply, and even a 32 GB micro SD card for all that precious data that will comprise your new super console. It comes with a sleek black case and HDMI cables too, so you can set it up right out of the box. Super Famicom Pro, $47: It’s basically a Super Nintendo with two control sticks. It’s the best of both worlds when it comes to bridging modern and retro gaming. It’s as great as a Pro Controller, only much more affordable. N30 Arcade Stick, $59: If you’re going to make a retro console, go for broke. This fight stick mimics the kind from your arcade days when you button-mashed the days away. Bluetooth Adapter, $19: There’s no need to buy a new controller to play on Raspberry Pi. This adapter plugs in via USB and lets you connect your Xbox One, PS4, PS4, Wii Mote, Wii U Pro, Joy-Cons, and Nintendo Switch Pro-Controllers. It works on PC and laptops too. Are you still salty about not getting an NES or SNES Classic Mini? Save your tears and fake it. There are cases for your system that make it look exactly like the retro console of your choice, be it NES, SNES, or even Game Boy. It’s not just for show. Each of these cases comes with heat sink functions to ensure smooth operations all year round. No television, no problem. This portable monitor spans 15.6 inches, which is larger than most laptop screens. It plugs right into your Raspberry Pi console, letting you use it anywhere. This even comes with a stand and protective cover to keep it safe and shiny. Now that you’ve assembled a gorgeous console, you’re going to want to show it off. Pack it all up in this carrying case, built with Raspberry Pi in mind. It’s got compartments for the console, every manner of cable, and even your controllers. The rigid hard shell casing protects your console from accidents and the elements alike. Even if you plan on using it strictly as a home console, it’s an affordable place to tuck it away when you’re not getting your game on. RetroPie is the program you’ll use to get games going on your new Raspberry Pi console. Playing retro games requires emulators, which use roms. Roms are digital copies of games that can be procured online. However, just a heads up: hoarding roms for games you don’t own is illegal. Plug the SD card that came from with your system and format it as FAT. Download RetroPie. It’s a fantastic super program that compiles emulators from countless consoles like the NES, Sega Genesis, and even PlayStation 1 and 2. Extract the program to your SD Card. Are you a computer noob? No problem. If you’re on Windows, use Win32DiskImager. If you’re on Mac, use the RPI SD Card Builder. Plug in a keyboard and boot up your system. You’ll only need your keyboard the first time so you can set up the Wi-Fi. After that, follow the on-screen prompts. Install the emulators you like, and use them to run roms of your favorite games that you can place on your SD card from your computer.